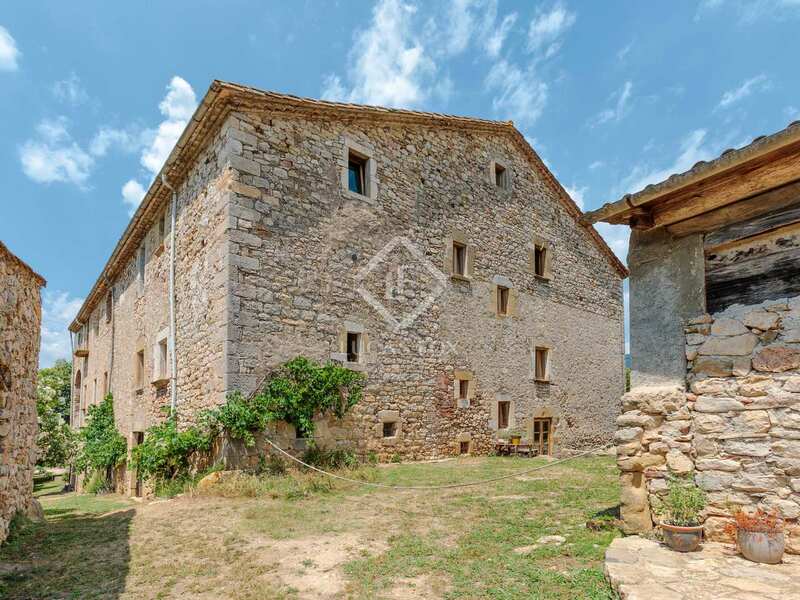 Countryside masia, currently run as a rural tourism business, for sale close to Girona city centre. 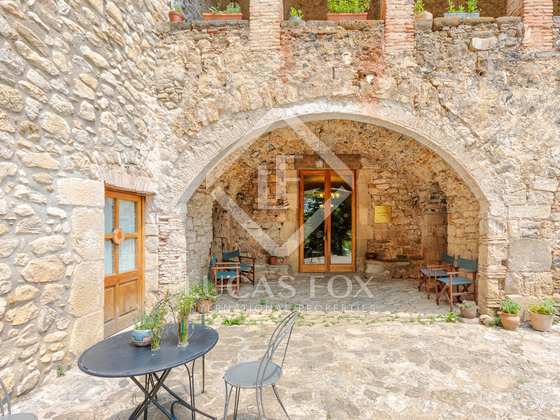 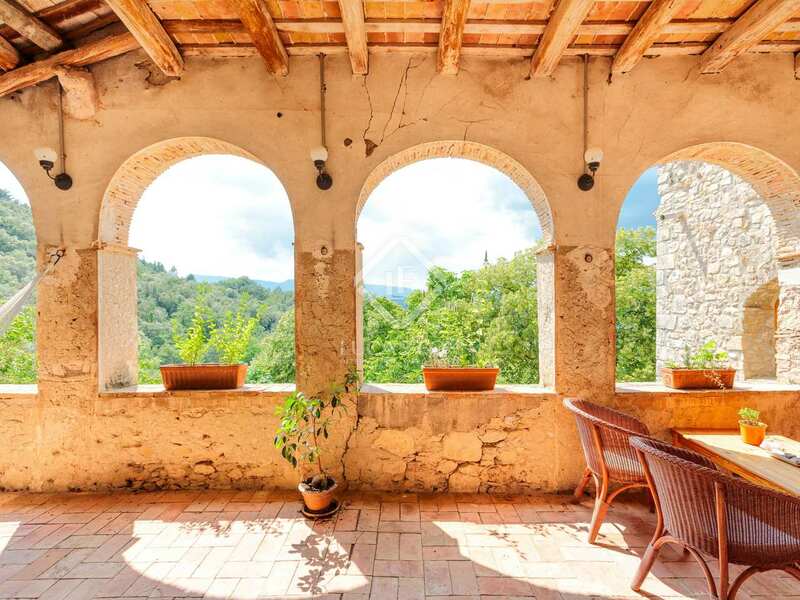 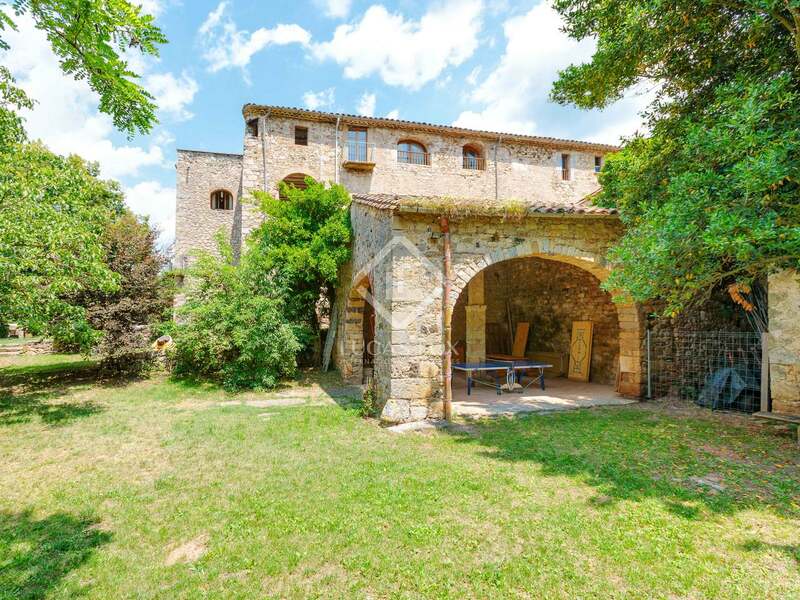 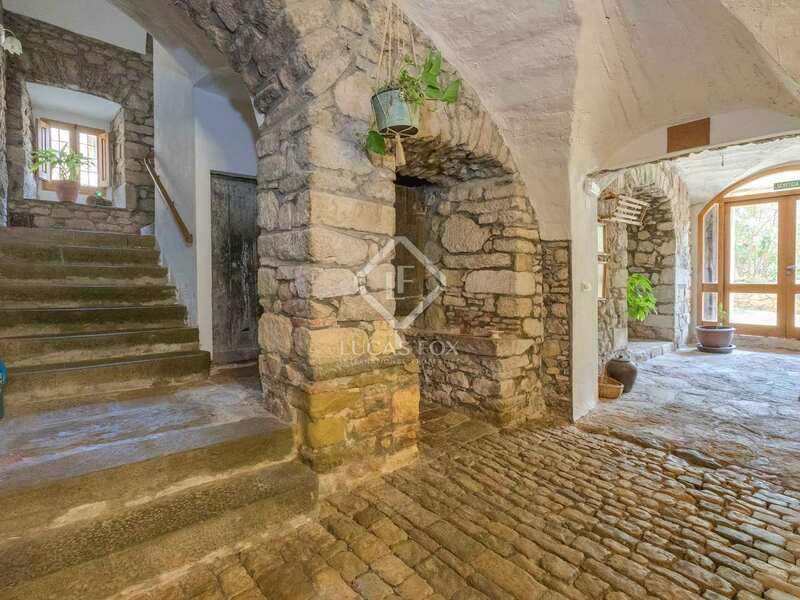 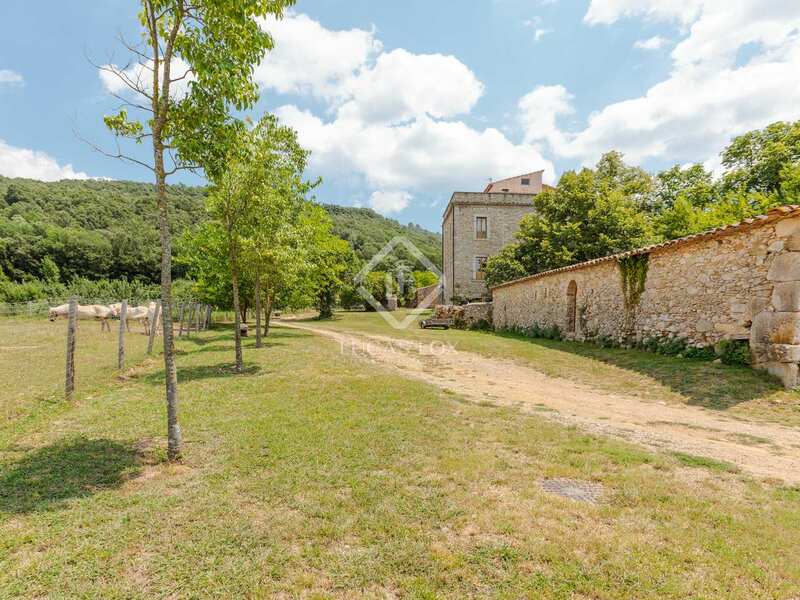 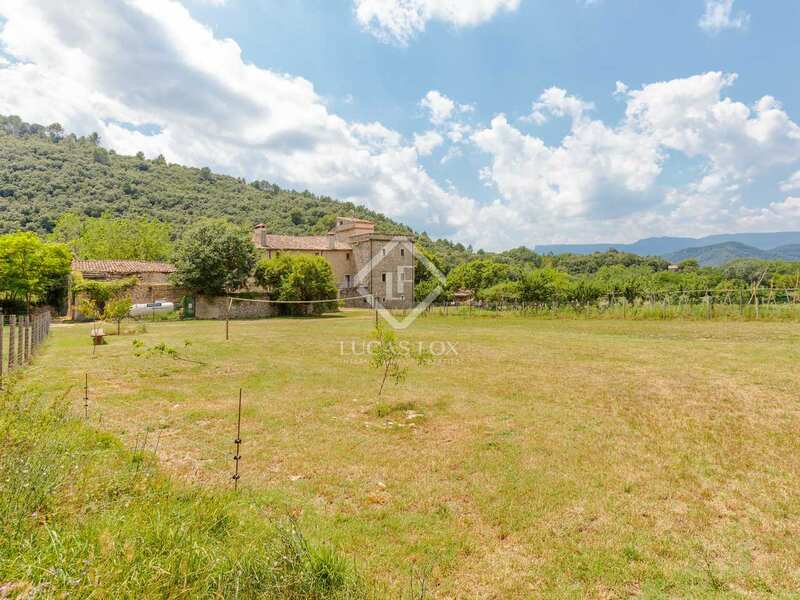 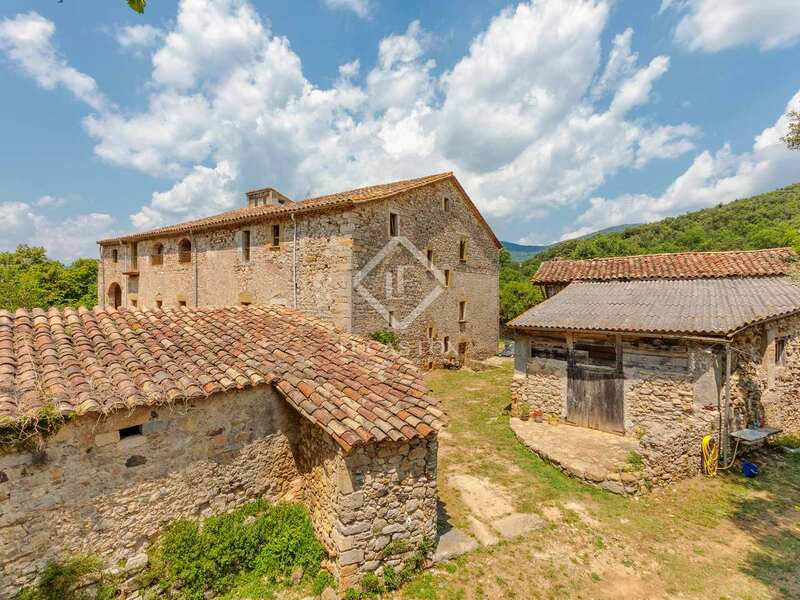 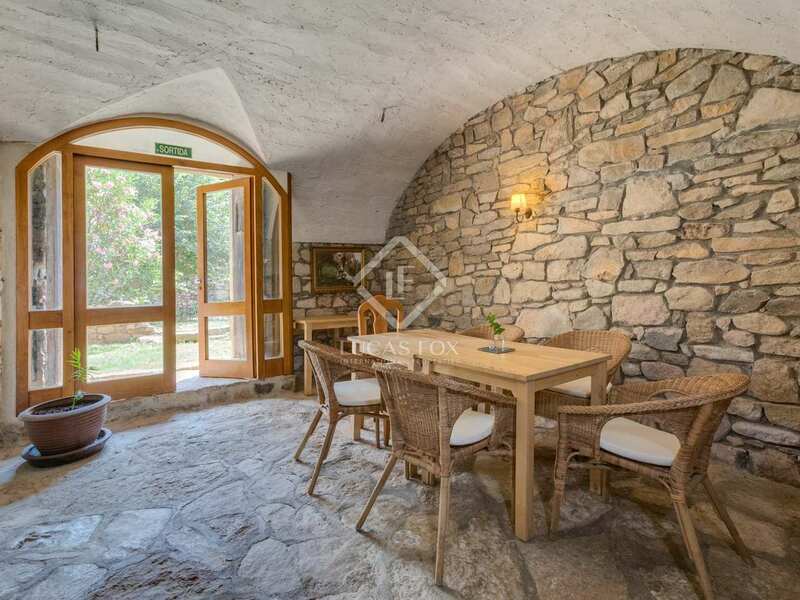 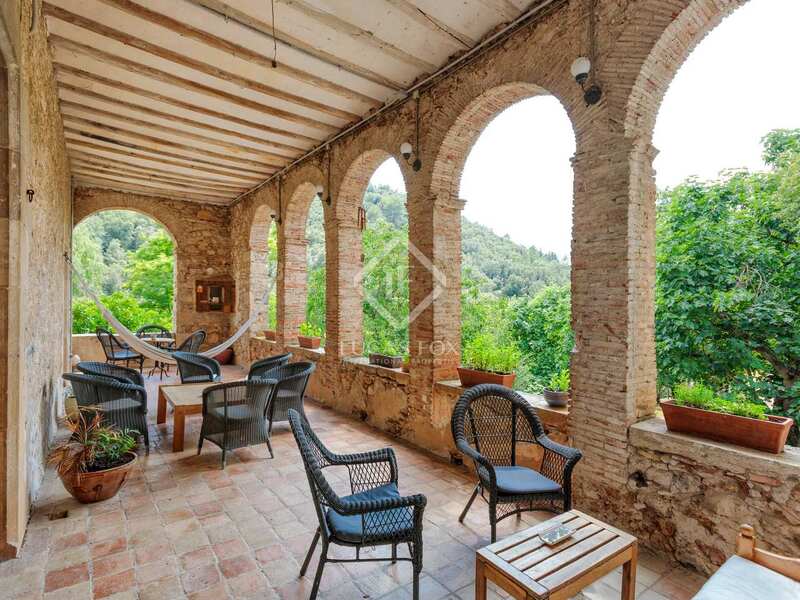 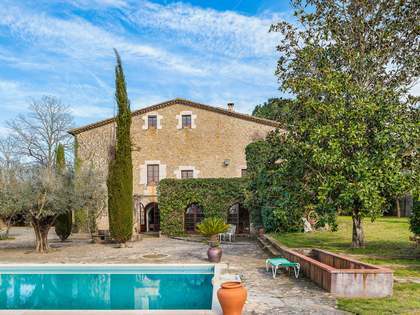 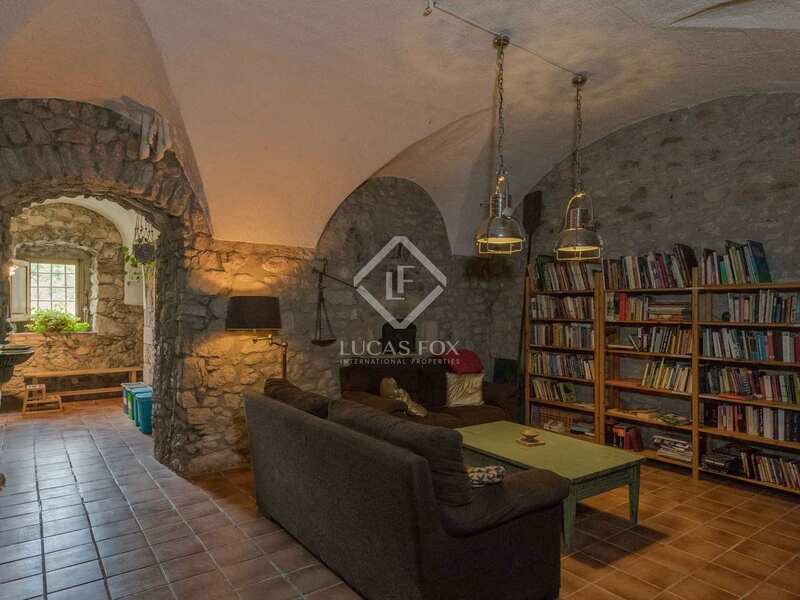 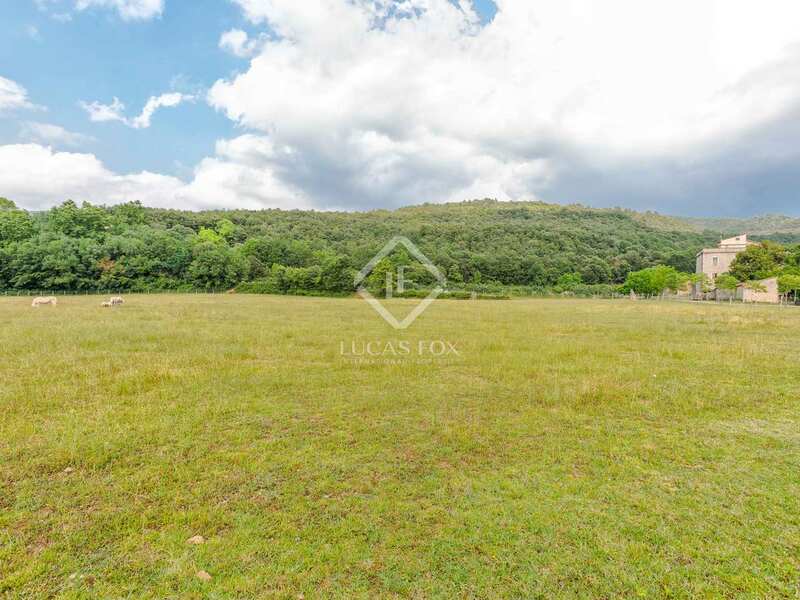 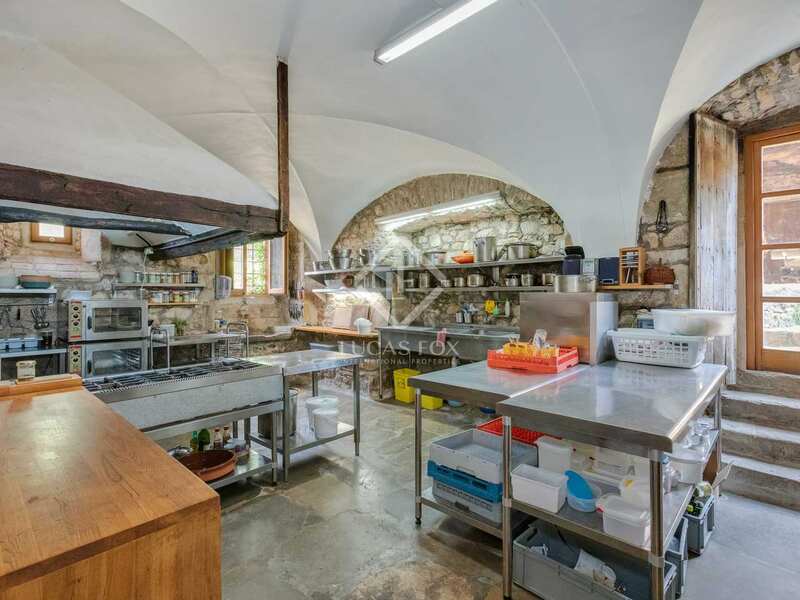 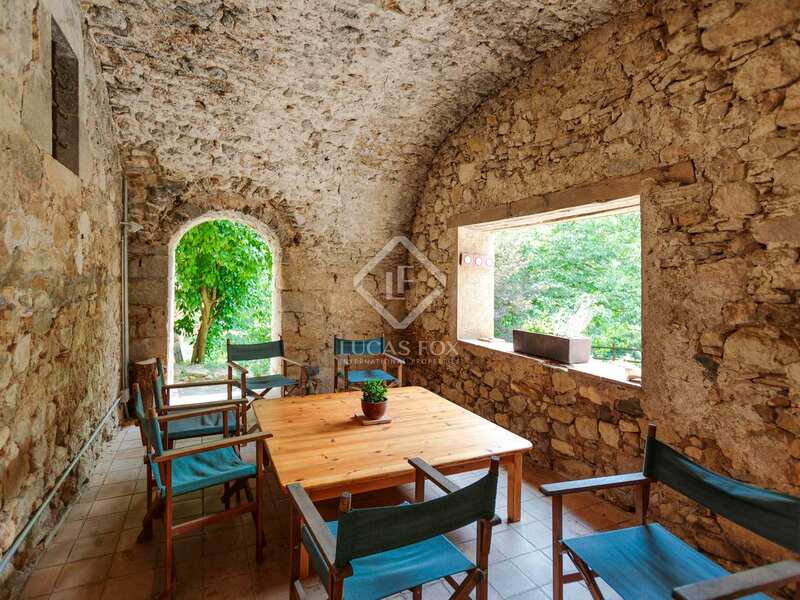 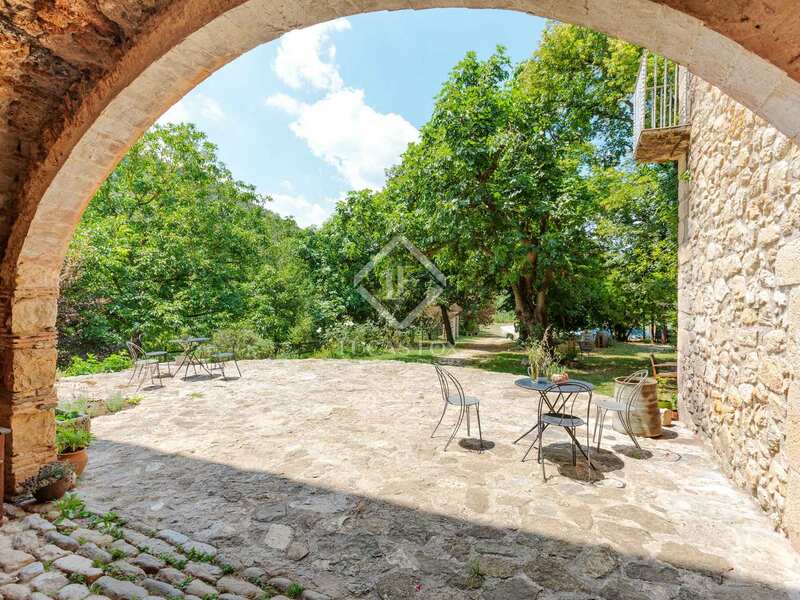 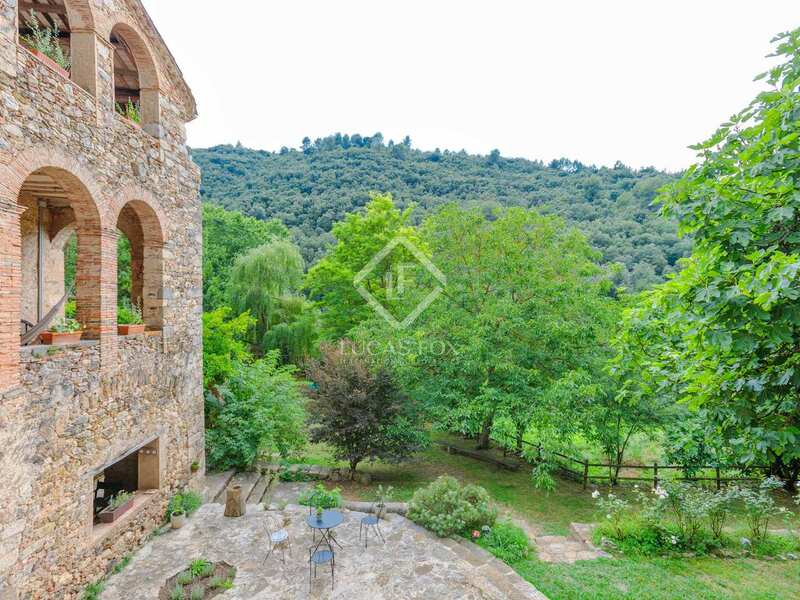 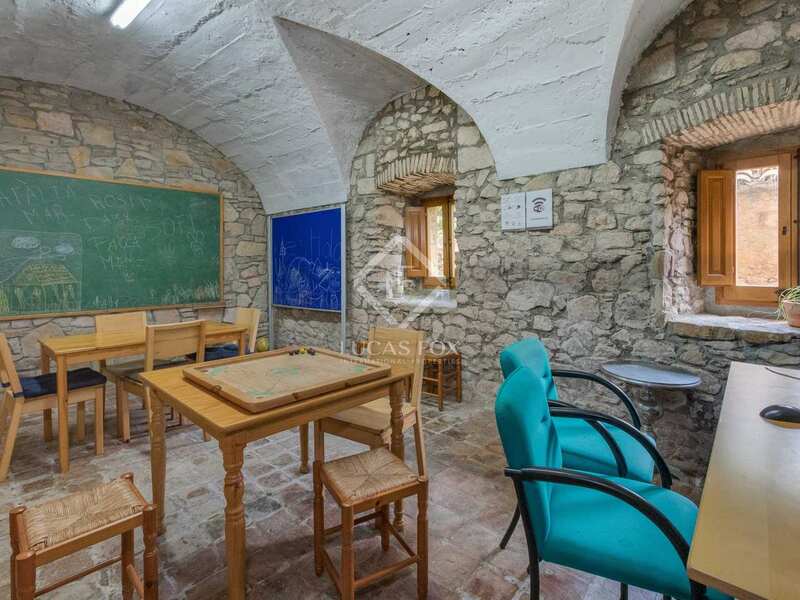 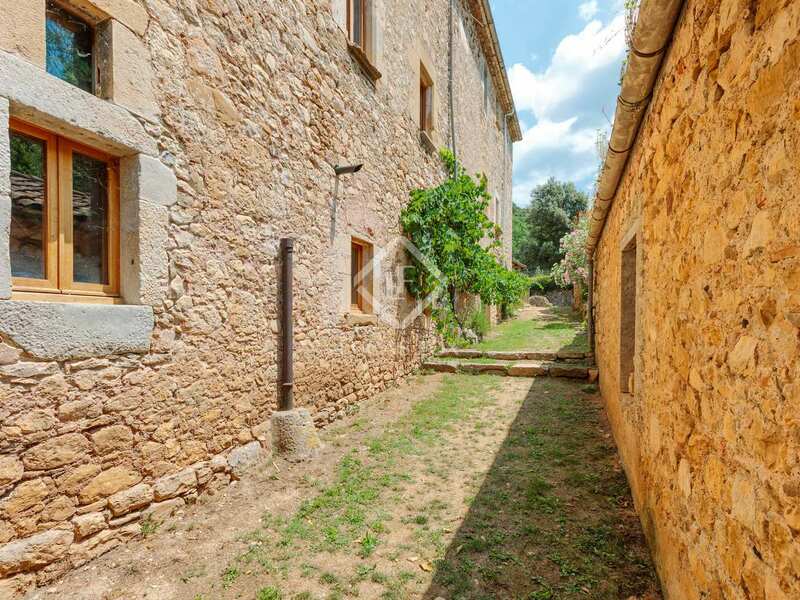 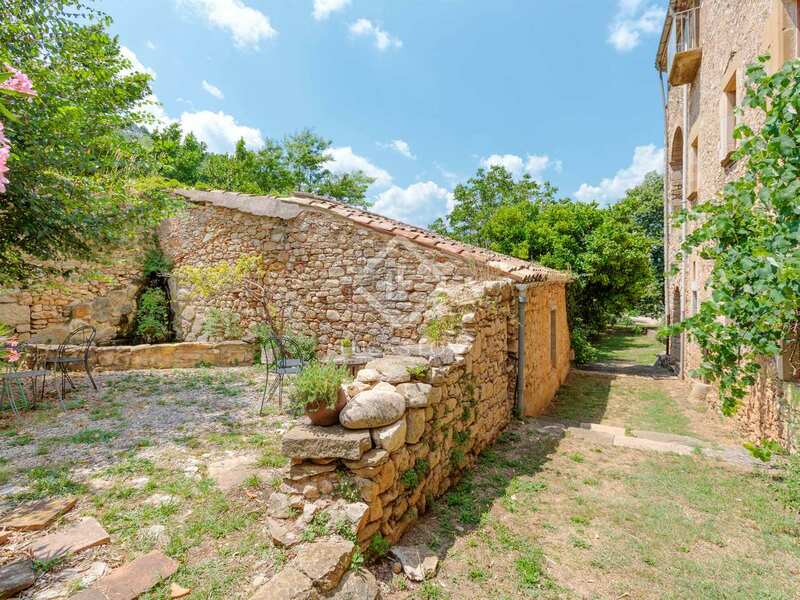 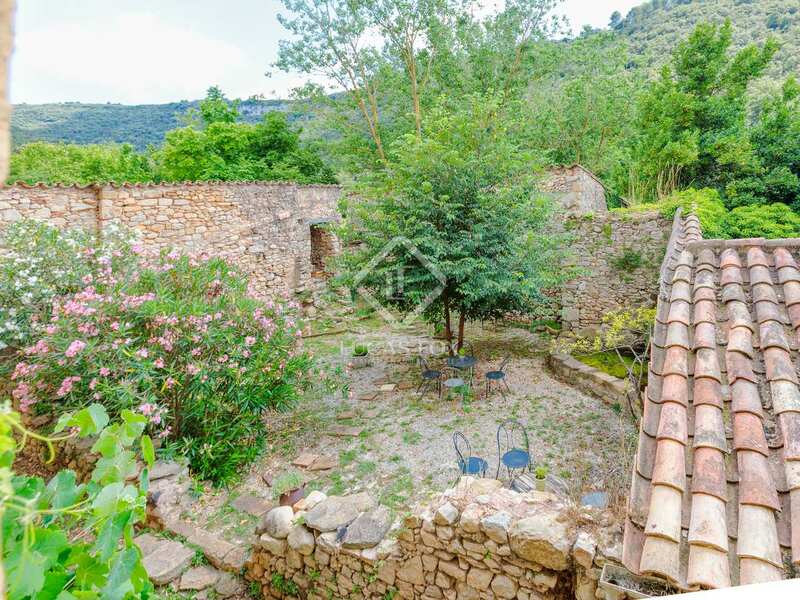 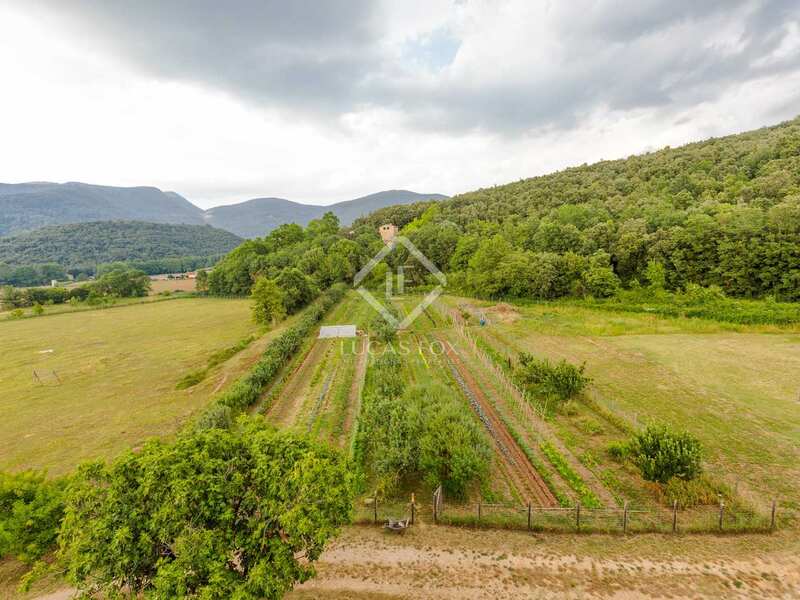 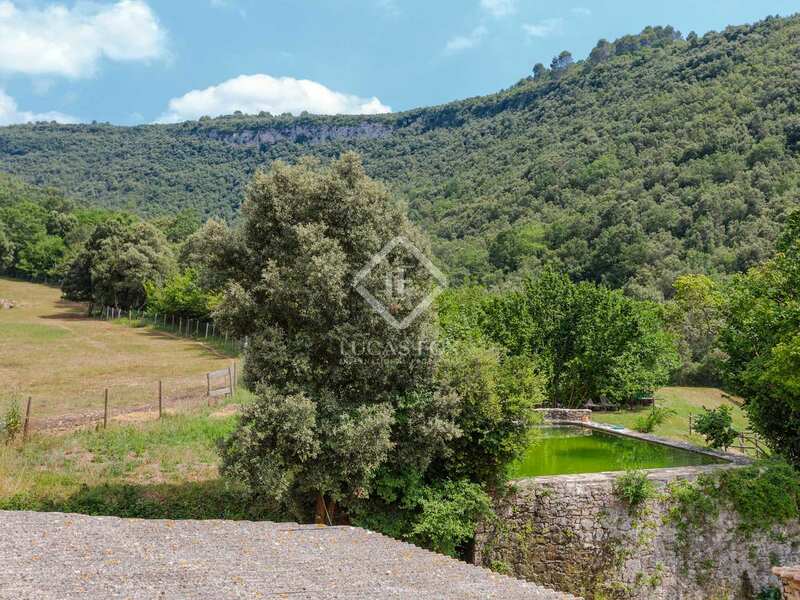 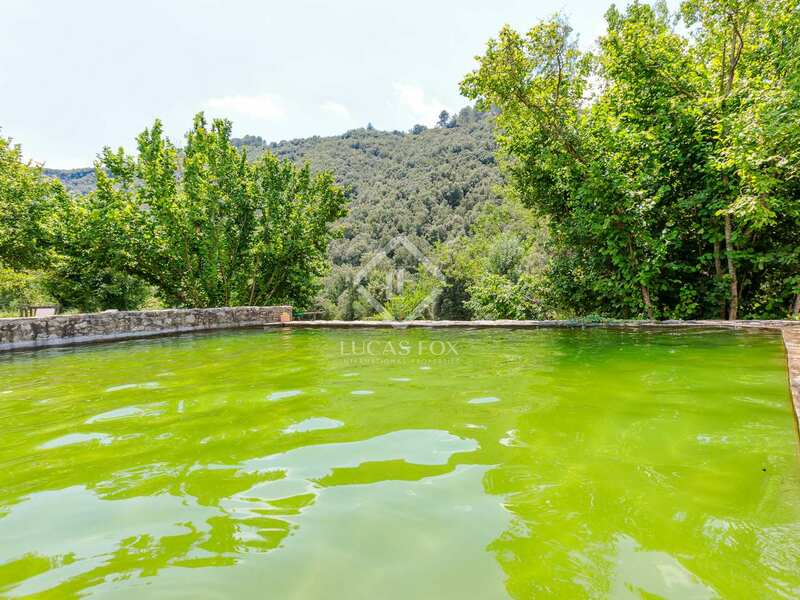 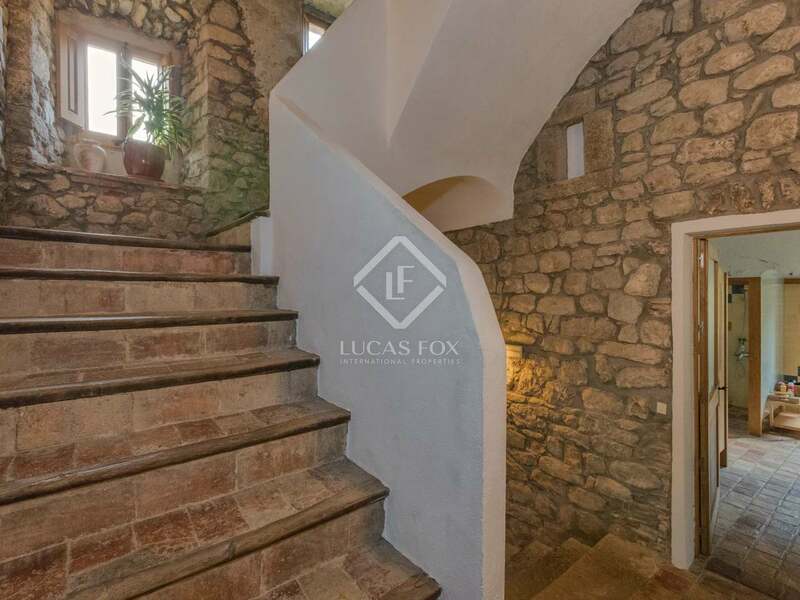 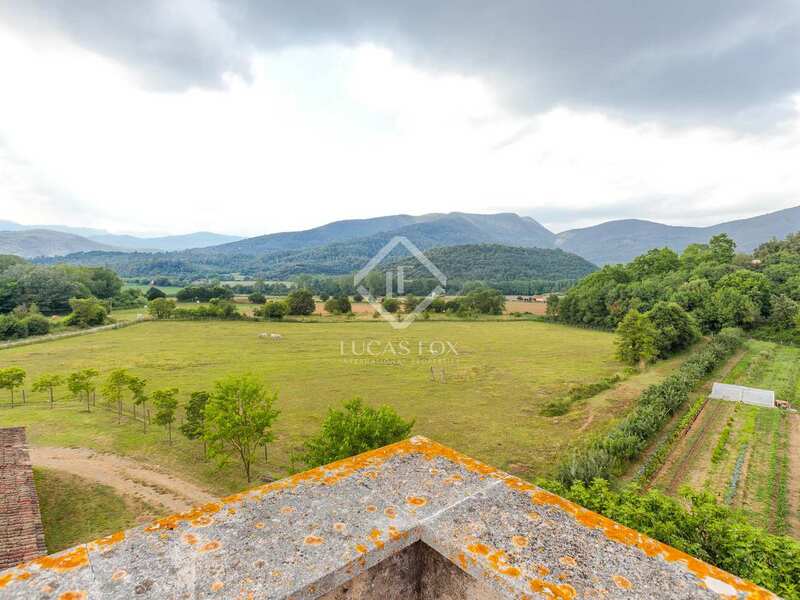 Rural fortified masia dating back to the 12th century located in the middle of picturesque countryside, just 25 minutes by car from Girona city center. 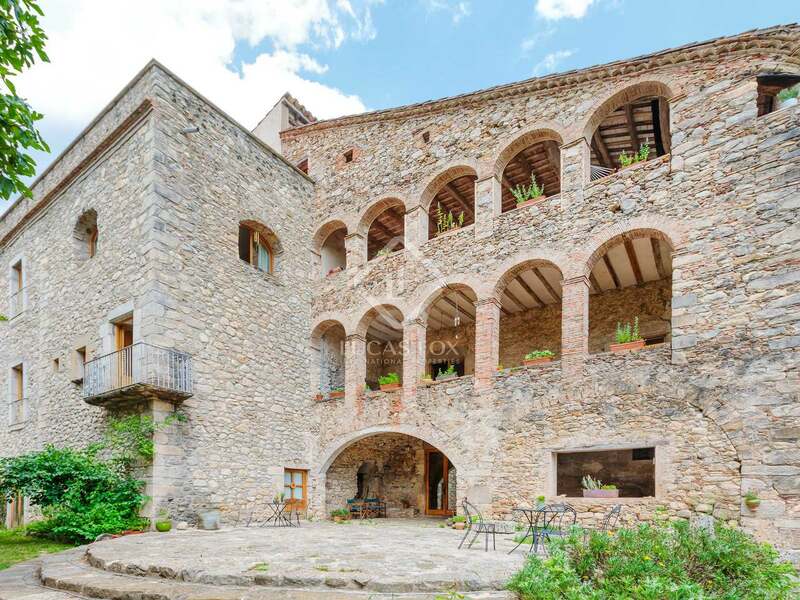 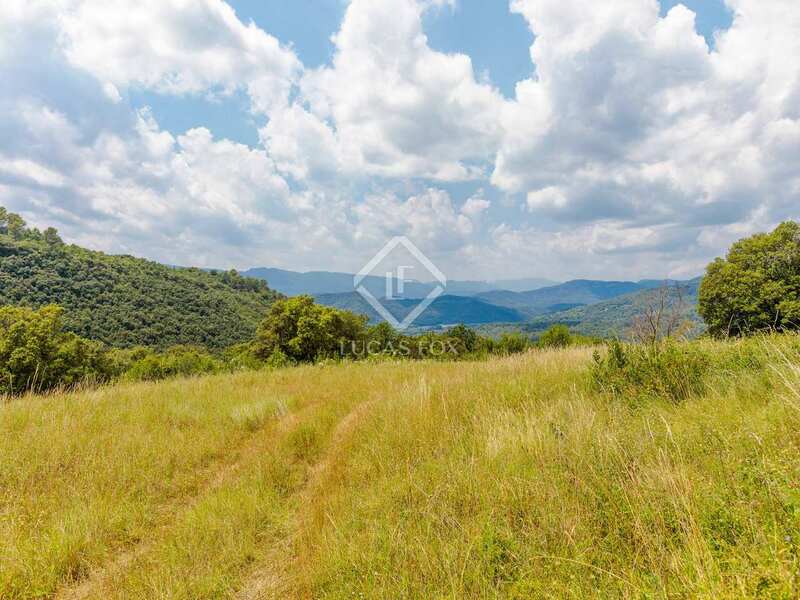 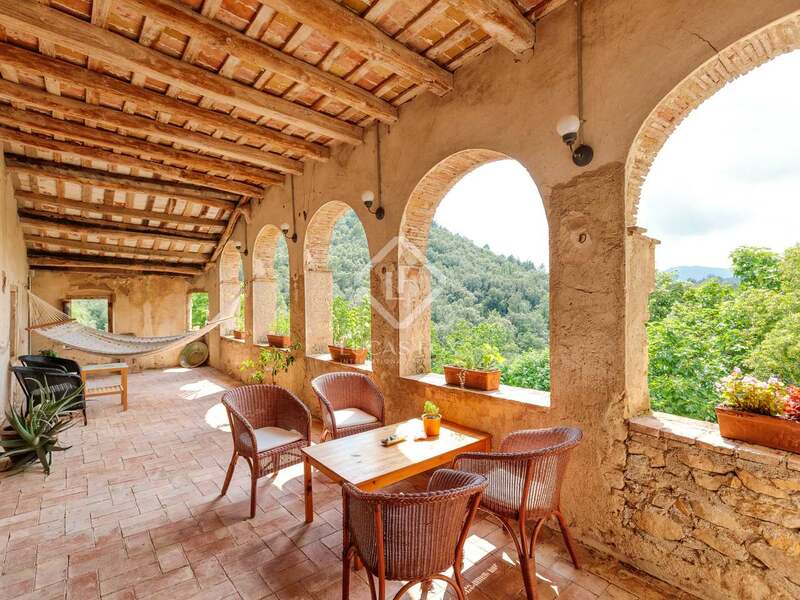 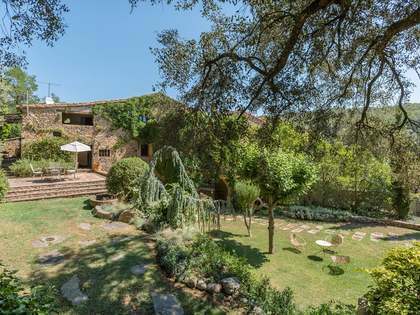 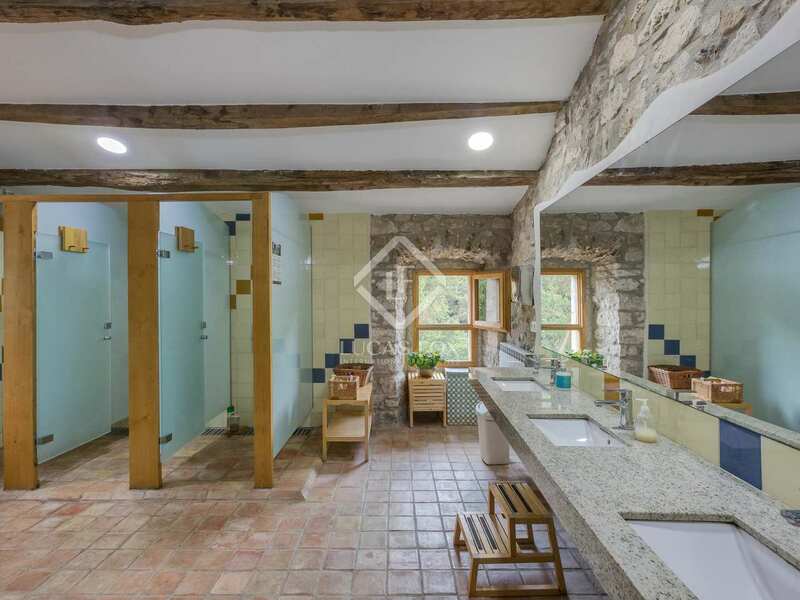 The property is listed as part of the Architectonic Cultural Heritage of Catalonia, boasts 174 Ha of land and enjoys stunning mountain views as well as an abundant private water fountain. 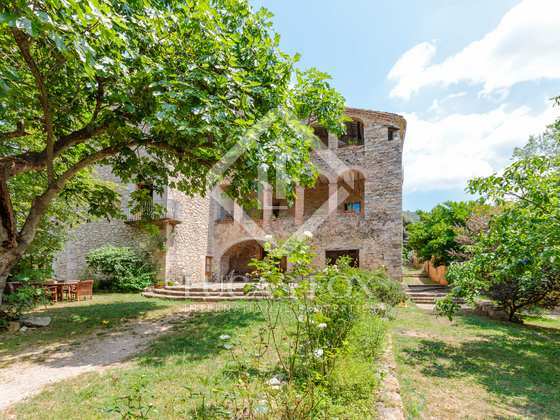 This is one of the standout properties of the area. 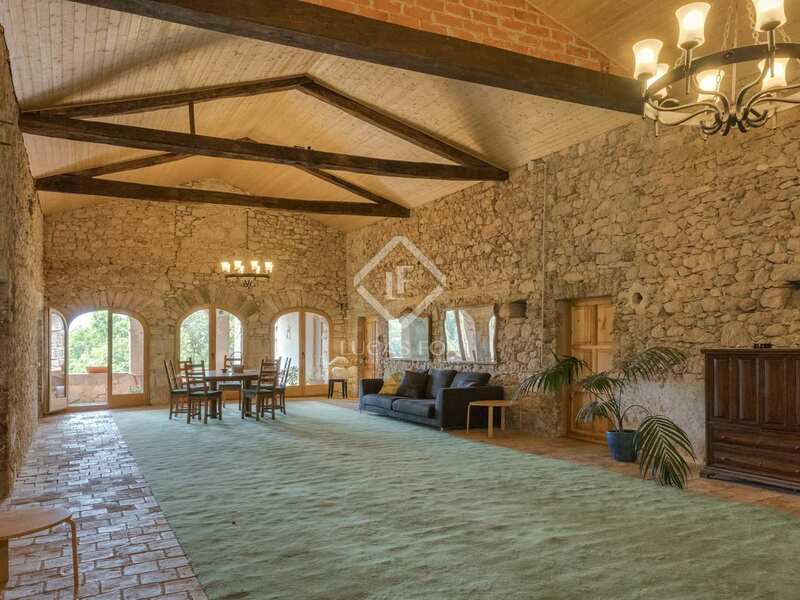 The main manor house stands proudly at the end of a drive which winds through the estate's private fields. 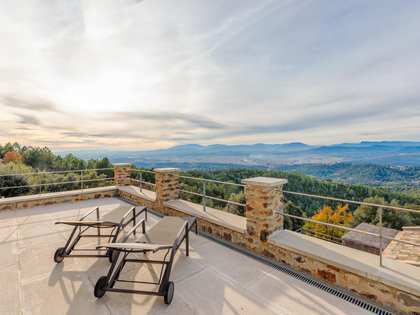 Behind the house, the private forest stretches far up the mountain to an impressive white cliff and beyond. 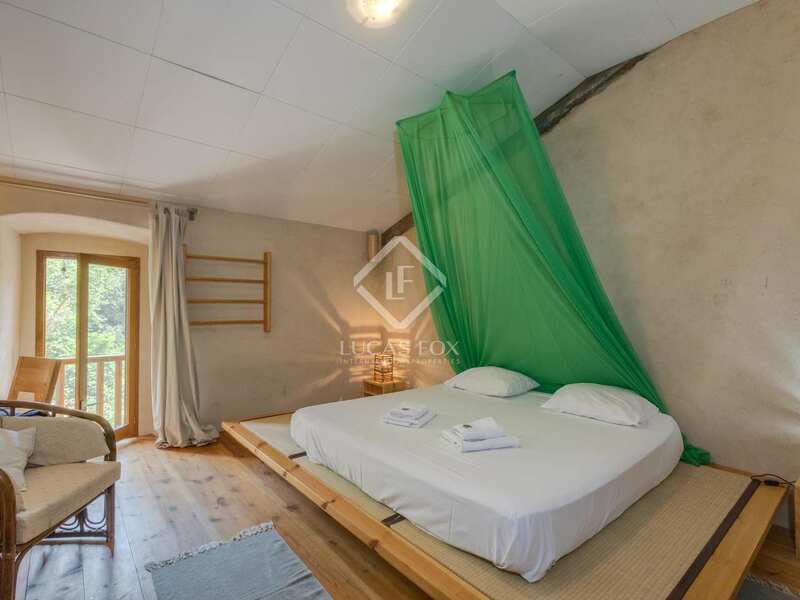 The property is now running as a rural tourism business and retreat centre. 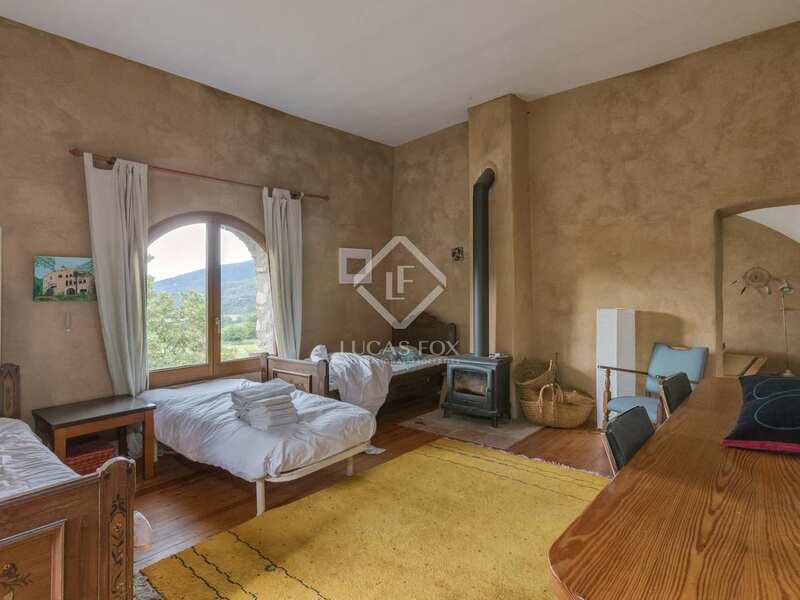 Its current owners have respectfully restored most of the main house using ecological materials and maintaining traditional building methods. 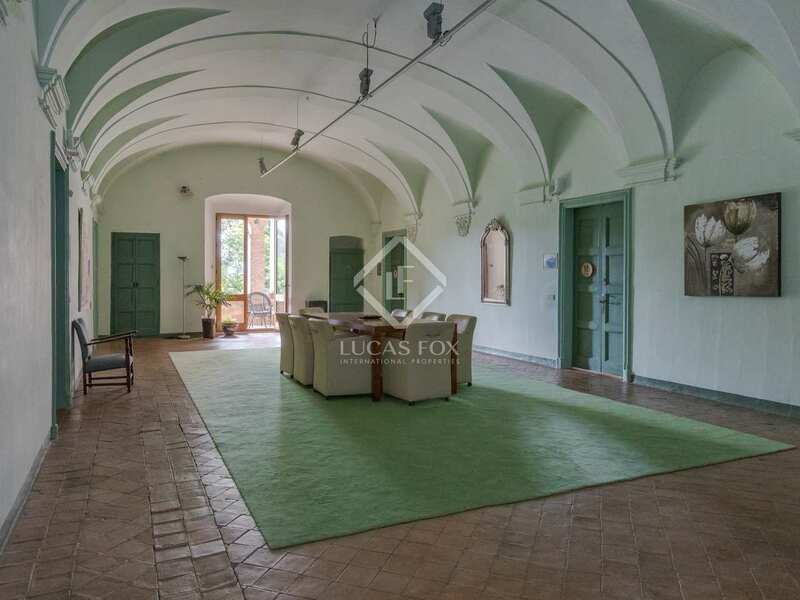 The main 17 bedroom manor house compromises 1549 m² spread over three floors and is in good structural condition. This building is currently used as lodging for guests and also the owner's accommodation. 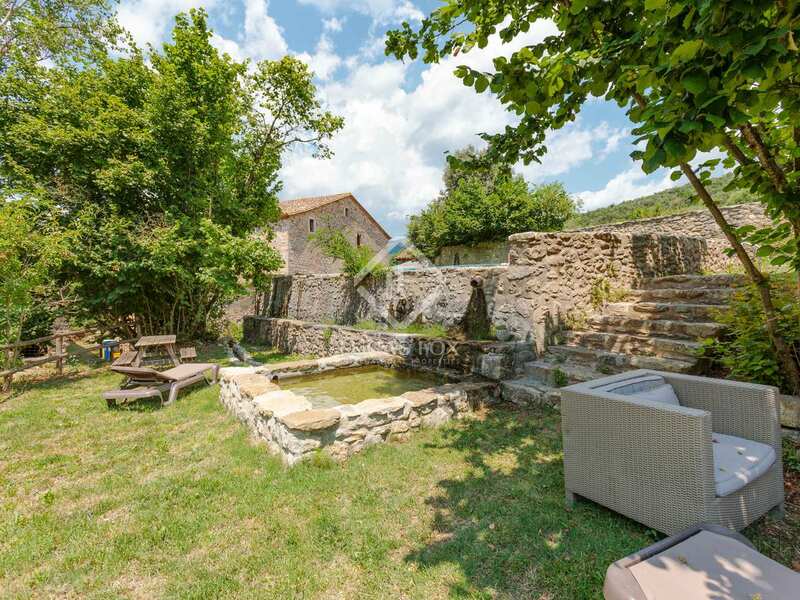 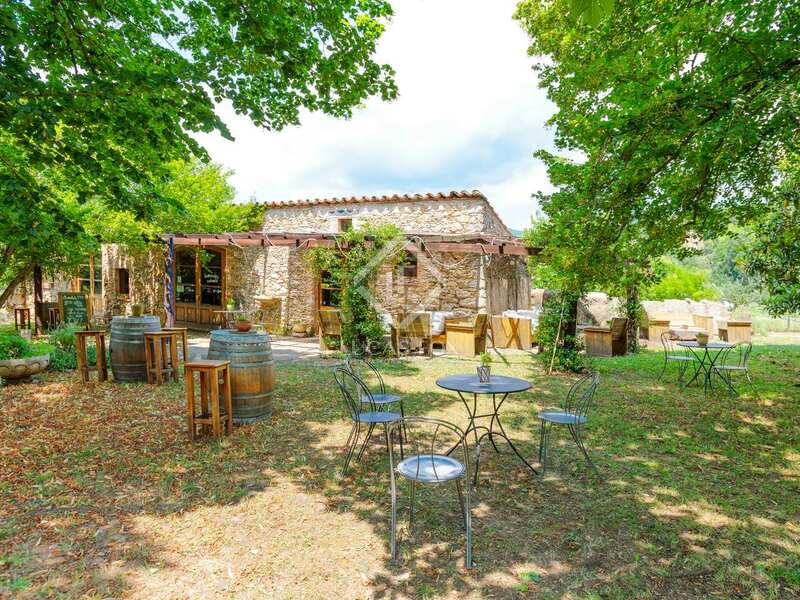 Just to the east of the house we find a 470 m² barn that is in need of complete restoration, to the south there is a 530 m² outbuilding which is also in disrepair and nearby there is a 104 m² outbuilding, currently restored as a bar/shop for the guests. 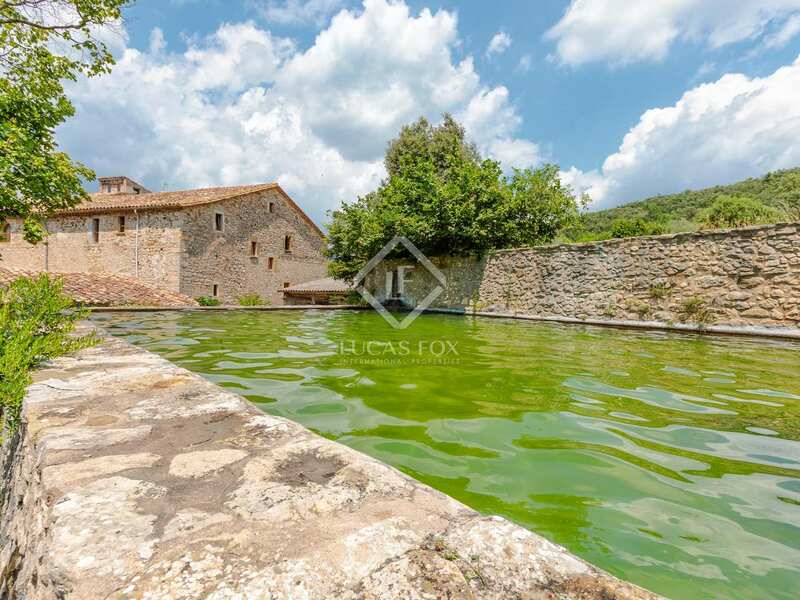 The traditional 80 m² stone water deposit doubles as a refreshing natural pool with fresh fountain water running through it. 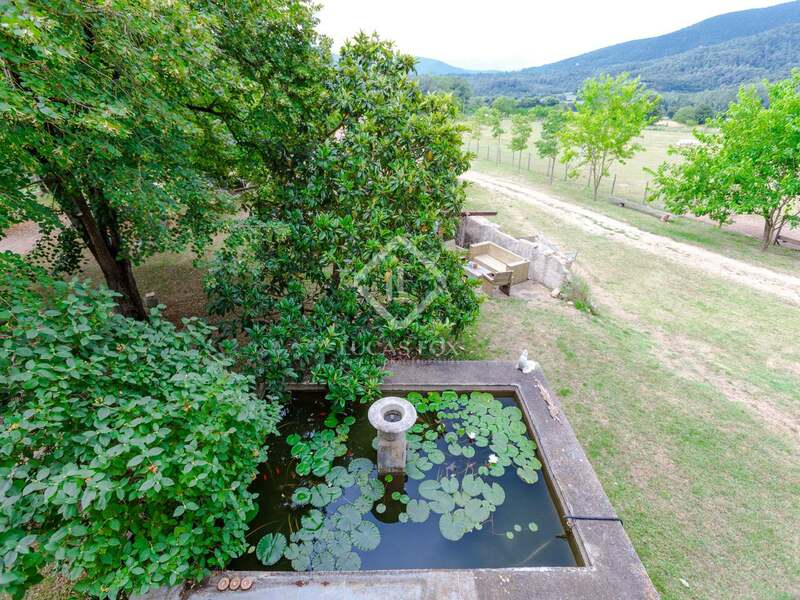 All the water from the estate comes from the private fountain slightly further up the mountain. 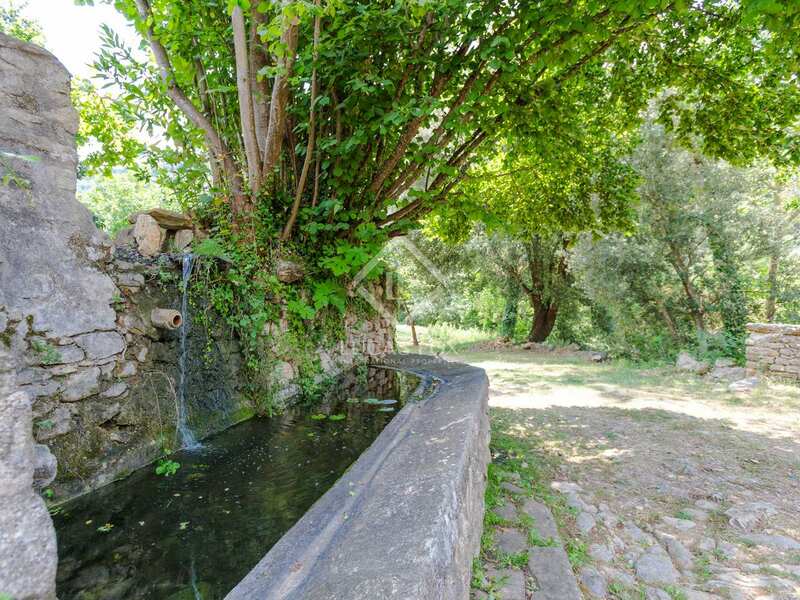 There is also a small stream that runs through the property. 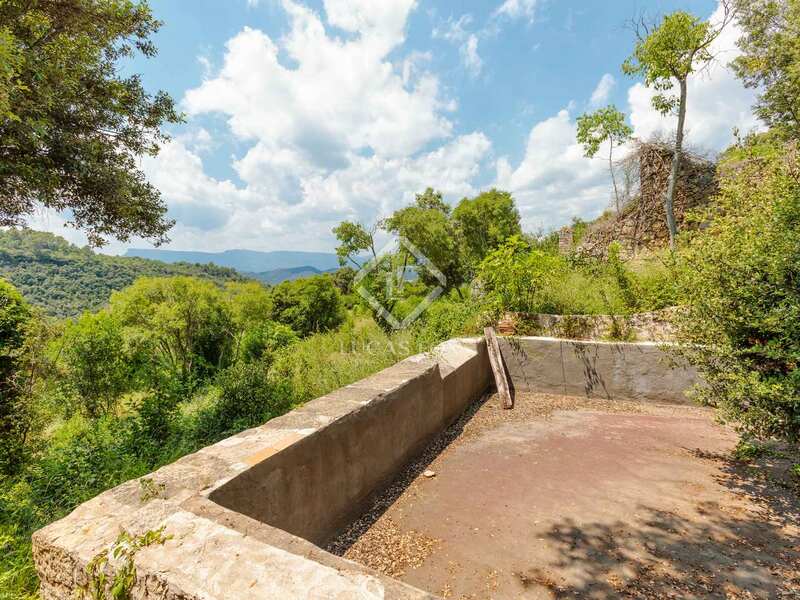 A private track that leads up the mountain takes you to a separate large 542 m² ruined farmhouse 1 km away. 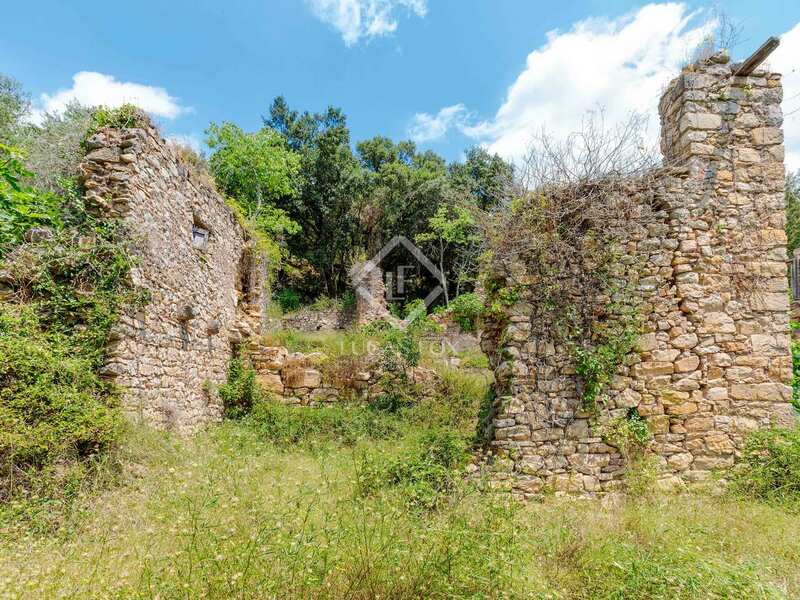 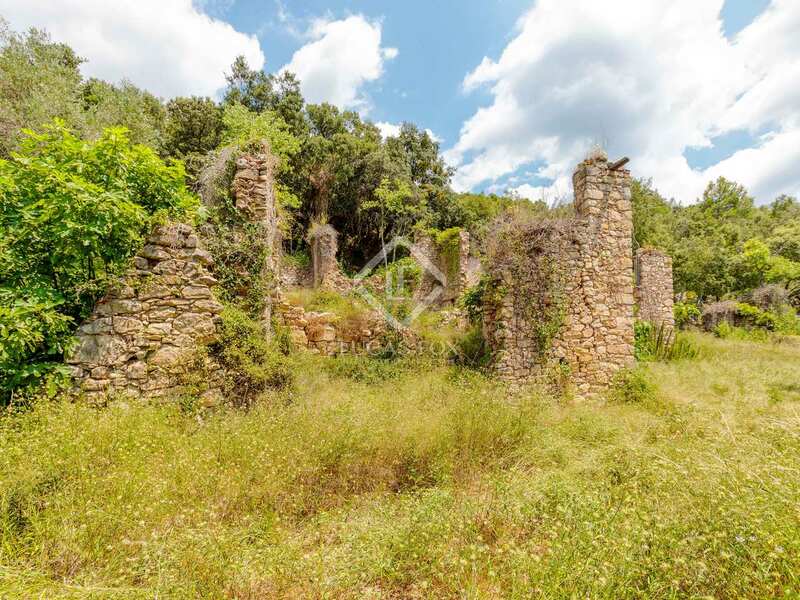 This ruin has permission de be rebuilt and could make a wonderful private home. 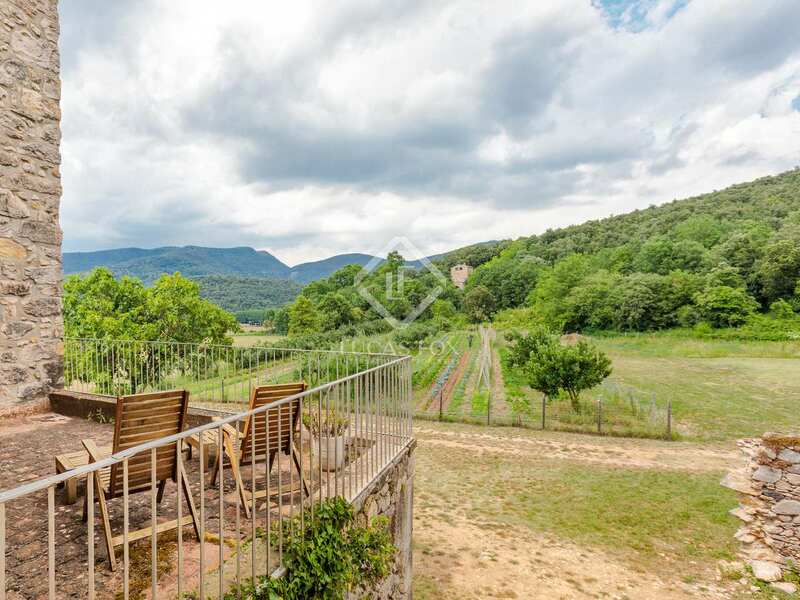 It has 3 Ha of terraced fields in front of it and dramatic views across the valley. 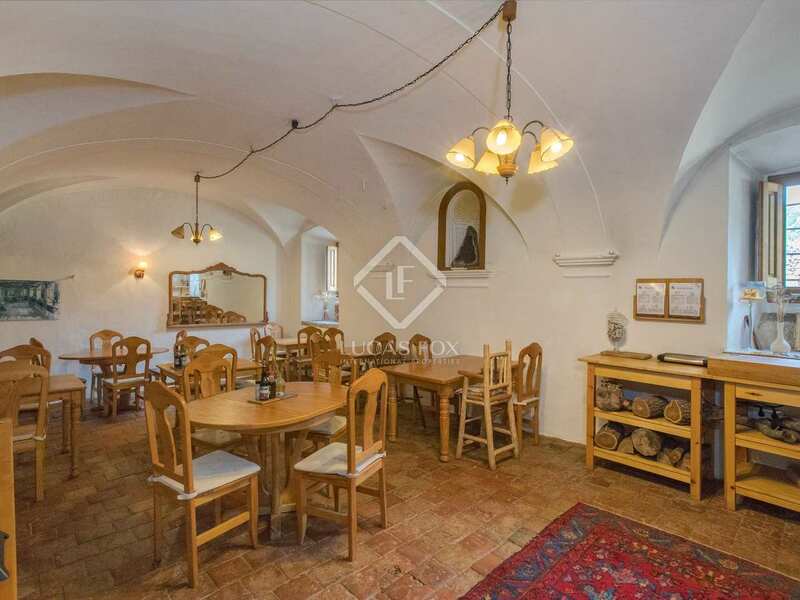 85 m² entrance hall, sitting room, 2 bedrooms, a shared bathroom, massage room, office, library, 40 m² dining room, 30 m² kitchen, extra 15 m² dining area. 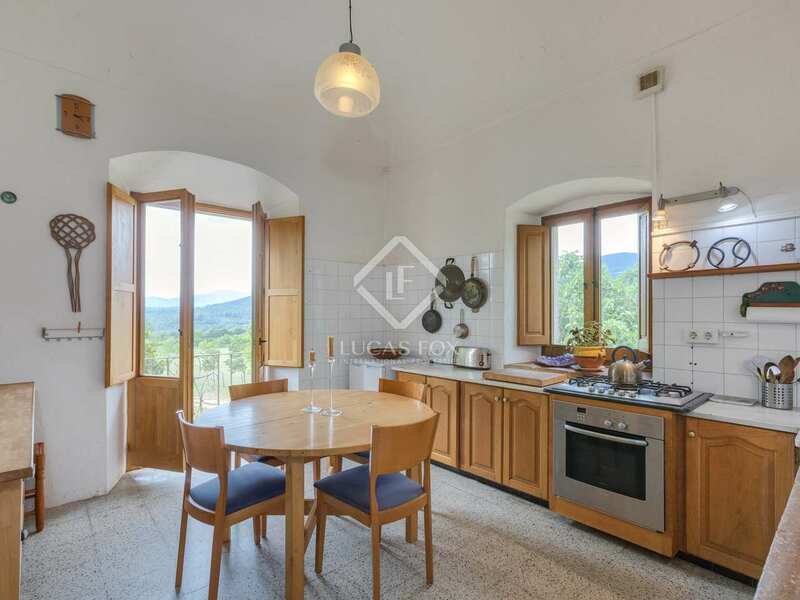 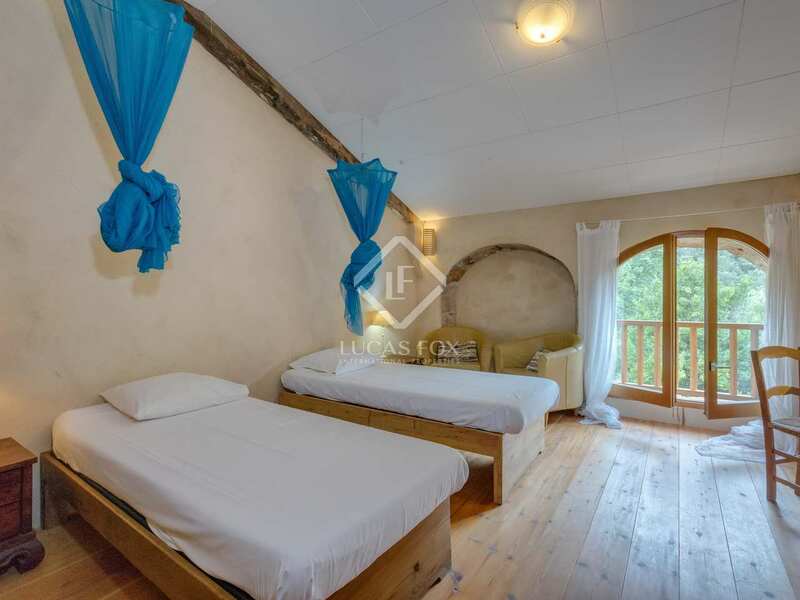 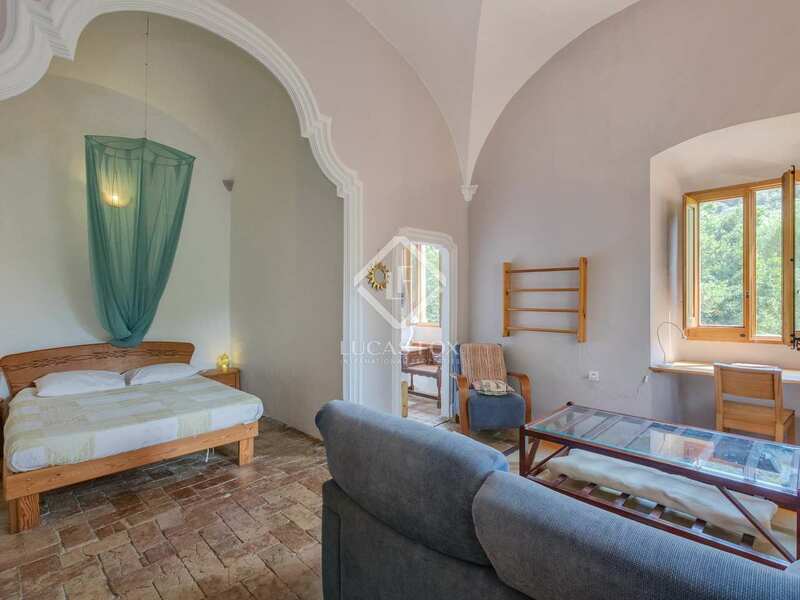 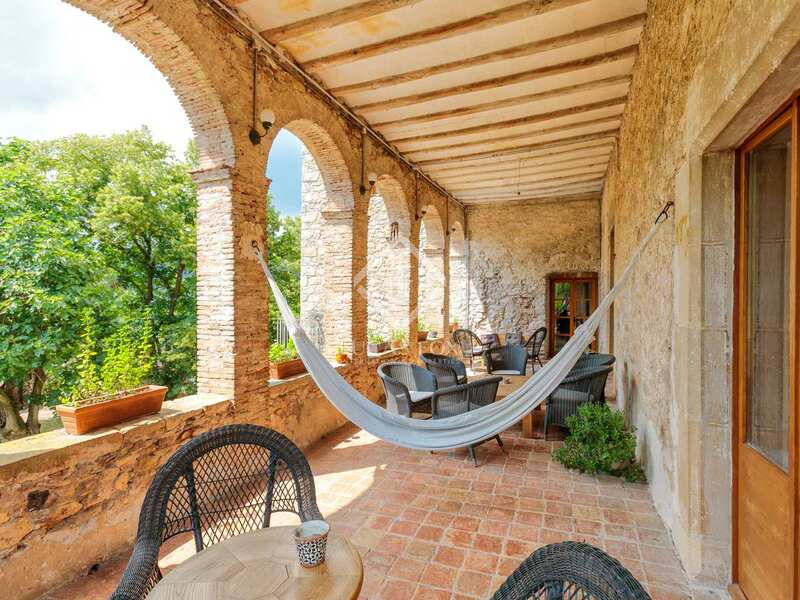 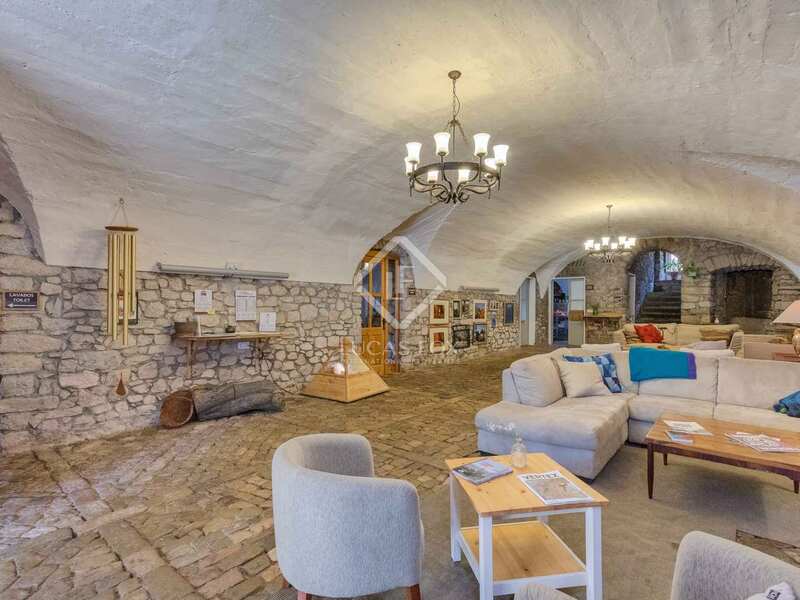 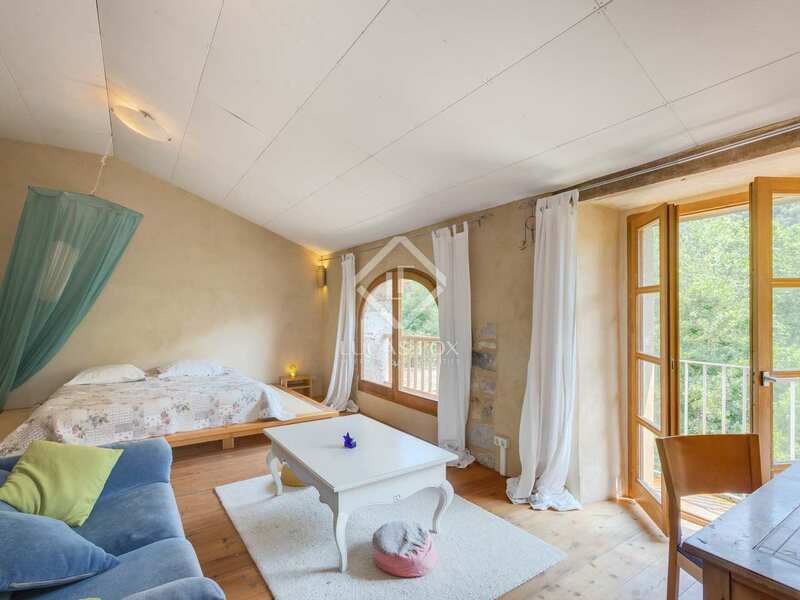 85 m² central hall, communal bathroom with 3 showers and 3 toilets, 7 large bedrooms with vaulted ceilings (one with a stunning private terrace), beautiful porched terrace with stone arches. 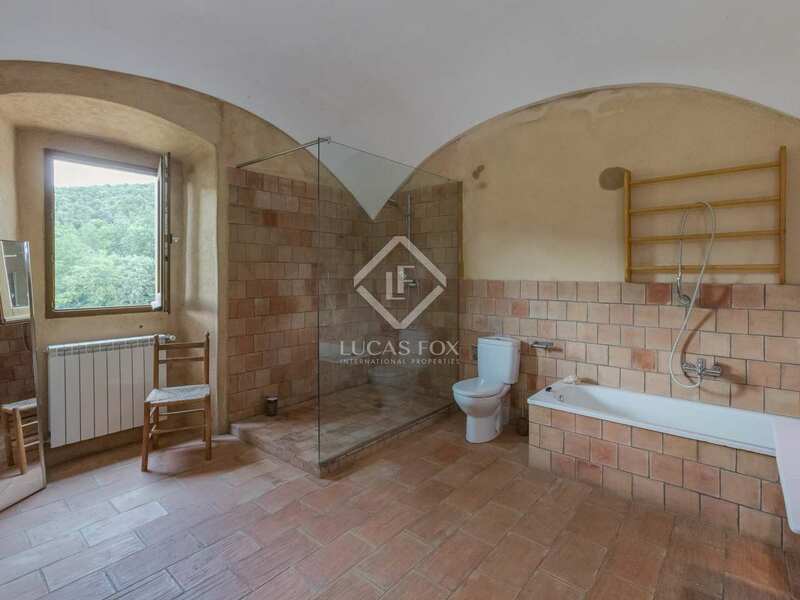 85 m² central hall, communal bathroom with 3 showers and 3 toilets, an independent 1-bedroom loft apartment, 6 large bedrooms and a beautiful porched terrace with stone arches. 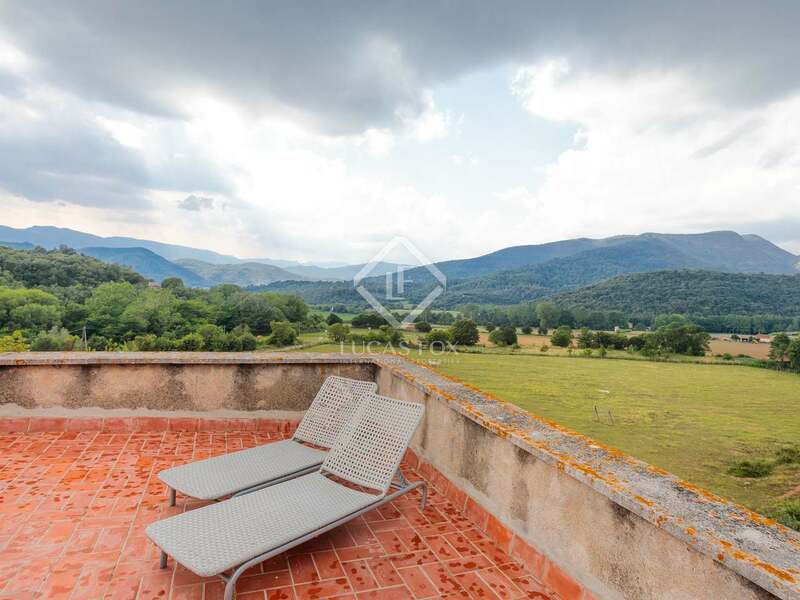 Large roof terrace with spectacular views. 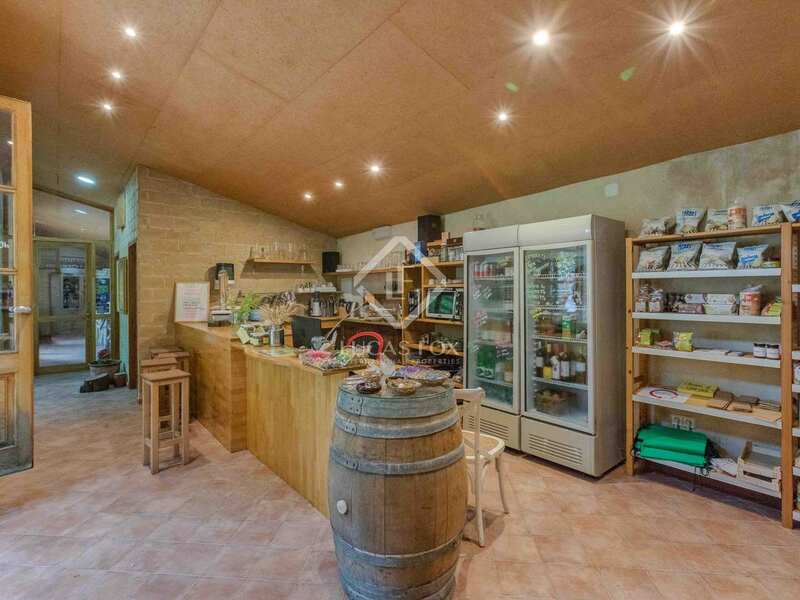 104m2 separate outbuilding with a shop, bar and toilets. 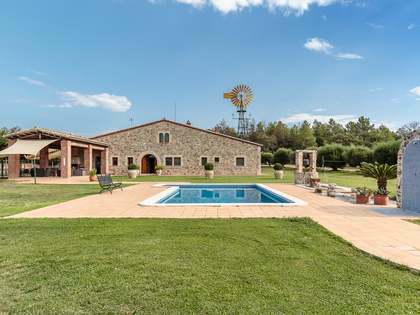 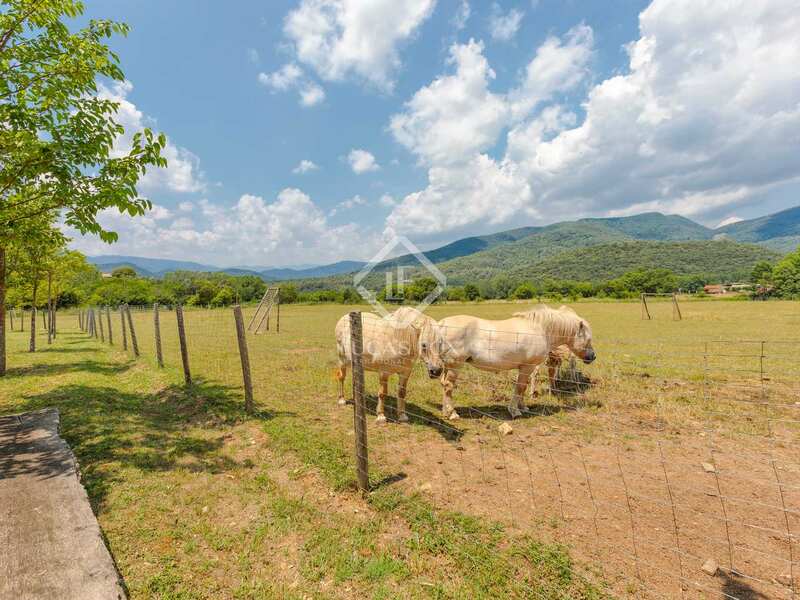 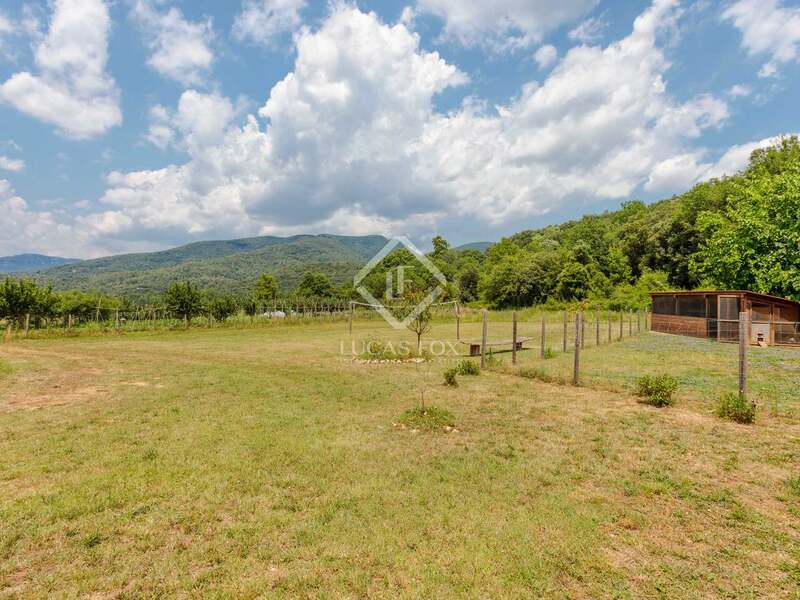 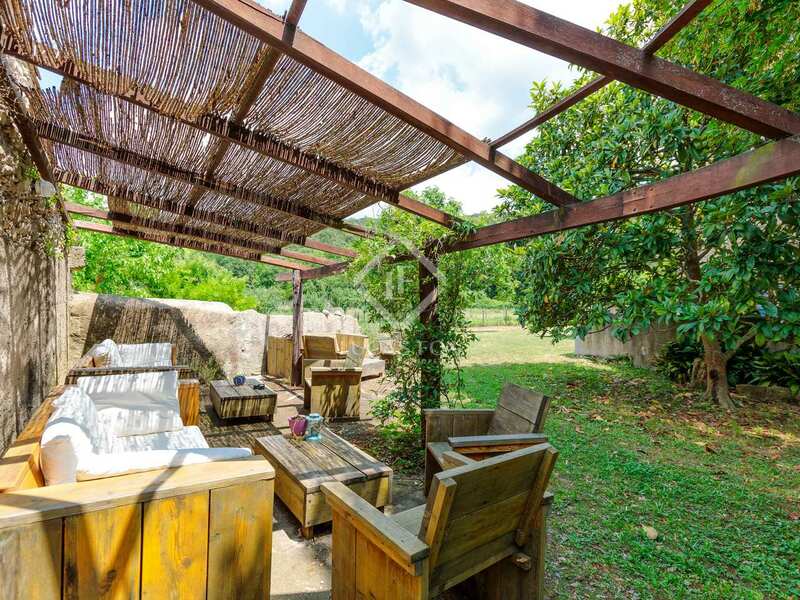 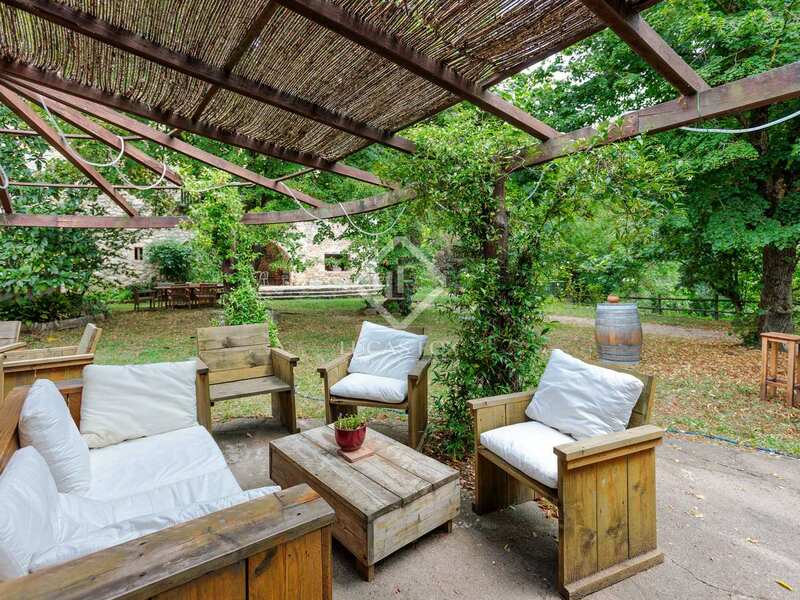 The property is located in a rural area of outstanding natural beauty, just 24 km from Girona city. 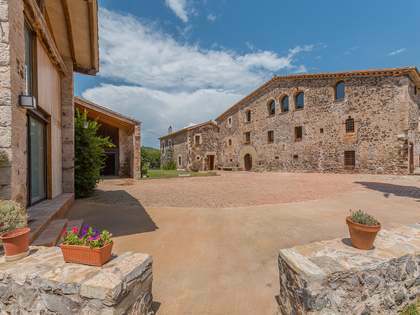 Girona airport and PGA golf course are just a 35 minute drive and some of the best beaches of the Costa Brava are under 1 hour drive away.